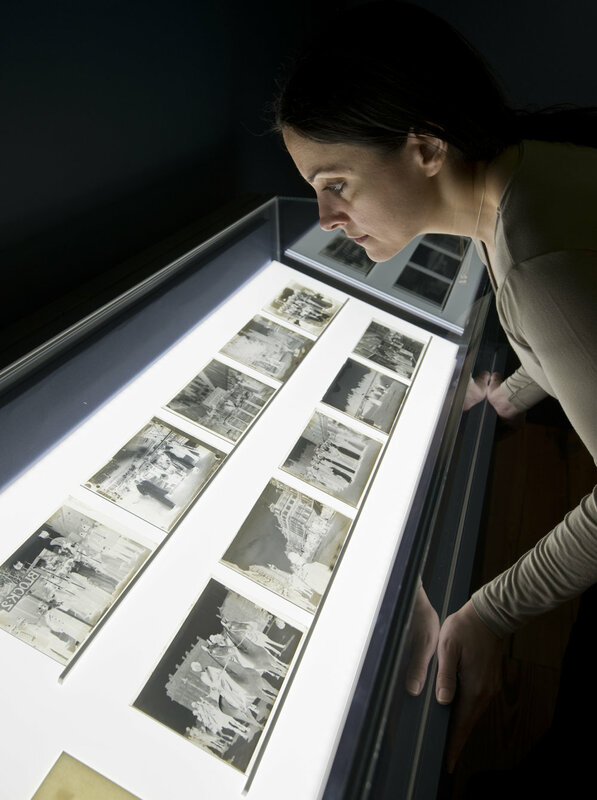 An exhibition celebrating the work of London’s first professional woman photographer. showing of both historic and new prints of the photographs taken by Christina Broom of subjects including the Suffragettes, the Royal family and British troops going off to war. she appears as an enlarged see-through glass panel that mimics the glass negatives that she worked with. the glass negatives that she worked with. dockland’s last surviving original Grade I listed warehouse buildings. "My own hopes for a visually creative and memorable space were exceeded from the offset by the designers. I believe they struck a perfect balance in combining a significant number of works with a fresh, clean and contemporary style. The design is sensitive to the aesthetic demands of the photographic and ephemeral content yet presents innovatively and boldly. As a result the space is beautiful, sophisticated and striking."